Staunton Colliery, Heath End Colliery, New Lount Colliery, Coleorton No.1, 2 and 3 Colliery’s, and Peggs Green Colliery) Compiled by Samuel. T. Stewart – Sept 2014 from various resources. The accident occured on the 21st July 1869 at the No 1 Pit of Coleorton Colliery. Herbert just sat down to eat his breakfast when a stone weighing more than a hundred weight (50.8 Kg) fell down from the roof onto his neck, forcing his head between his legs, causing a fracture of the lower part of the spine resulting in paralysis below the injury. You have created an amazing site in the memory of those men. You are perhaps wondering why a French lady is interested by the English mines, well, this is because I used to live in the coal mine area of the Pas-de-Calais (Nord-Pas de Calais Mining Basin) before I came to England 24 years ago. I had relatives who worked in the mine and cared for the Pits at the time of the Second World War and who was perhaps one of the last visitor who went down the working mines in the Pas-de-Calais before the mines were closed. It was a very special occasion when a Malaysian pen pal and I were welcomed to spend a day underground, it was memorable! and we both came out 'black as miners', thinking of how much we'd like them to be paid more, so their work down the pit was hard and laborious. It was hot, sticky and dusty, we had to crawl on our knees sometimes, the engineer with us was regularly reporting on gas to the surface, to bring more air...all inspiring. 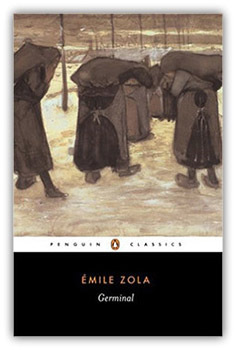 I also study Emile Zola: 'Germinal', and this was a study which shows us how hard it was in the early days of mining, gas explosions, water bursting in the pit, all those terrible catastrophes which happened underground. So I was touched by mine and mining accidents, as I had friends whose dad's lost their lives in some of the last mine disaster in the Pas-de-Calais, in 1970 in Fouquières where 16 men died, and in Lens-Liévin on 27th December 1974 where 42 men died. We were always heated by coal fires at home; it was the same at my grand-parents but also in most of my Family. Life was hard for miners, they worked for us to be warm! In fact, I started 4 years ago to do some researches for the men who lost their lives during the First World War in 14-18, from the town of Coalville, but also from the villages of Swannington, Thringstone and Barton, because during the First World War my paternal Grandfather, at 14, became a 'Kid soldier' when he tried to re-join his dad and was separated from his Family for all the time of the war. And as I was living in the Mine area of the Pas-de-Calais, I was touched by mine disasters. My same Grandfather was requisitioned to care for the pits of our town and the neighbouring towns when people had evacuated. My husband an engineer with the passion of steam, has been retired for 12 years now and has been helping the Heritage Trust with the Swannington Windmill and the site of the Califat/Alabama pit/Windmill Pit also called Coleorton Pit, so he talks to me about the search for the Califat and as I was made financially redundant from the education 4 years ago when I started to get involved with the First World War soldiers, though I'll be willing to do this research for the Miners, and how right he was! 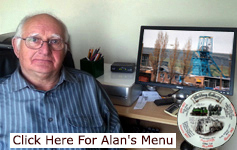 Dear Alan, Thank you again for this great site you have created. Just browsing on your website and came across a Mr Thomas Pilgrim of Mansfield Woodhouse Yorke Road. My Father Mr Hebert Turton was at the accident at that particular time as they were close friends. I can vaguely remember my mum and dad speaking about him. He actually started my dad watch repairing. Found this newspaper cutting in my Father's belongings, he is 89. We are related to Arthur Cutts, he was dad's Uncle on his Mums side. Great site and information is fantastic, I am currently trying to get my Uncle Alfred’s name put onto the Memorial at South Kirkby along with one other a James McNamara who was killed at Frickley Colliery 6th May 1954, through your site I now have his information. However regarding my Uncle Alfred Wall I cannot find a record from 1923 on his death at South Kirkby Colliery, I have attached his coroner’s report to confirm the death and wonder if your records could be upgraded. 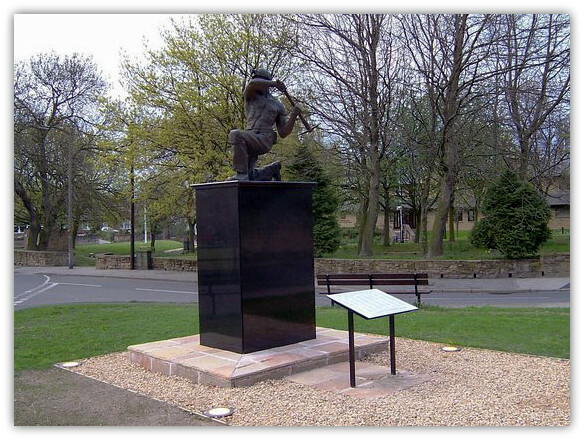 Miner sculptured by Graham Ibberson and commemorating lives lost in the local drift mines and collieries. The statue was unveiled on 27th November 2005. Mr Alfred Wall (26), a ropeman of Queens Terrace, South Kirkby, was killed in the Barnsley Seam of the South Kirkby Colliery on the evening of Friday 16th March. The Coroner (Major Arundel) and a jury held an inquest, into Alfred’s death, at the Moorthorpe Police Station on Monday 19th March. Mr E. Hey was foreman. Mr W. J. Charlton, Her Majesty's Inspector of Mines, was present along with Mr C. Snow (agent), Mr Kirk (Manager), representing the South Kirkby Colliery Co., and Mr L. Burns and Mr S. Davis representing the Yorkshire Miners Association. The deceased's brother, John Wall, a trammer of 5, Percy Street, South Kirkby, confirmed that the deceased was indeed Alfred and added that when he last saw Alfred alive, on Friday afternoon in the pit, he was in good health and working. He said that although he worked in the same district as his brother he was not in touch with him at the time and did not see the accident. Samuel Robbins, Colliery rope-runner, of 737 Kirkby Road, Hemsworth, was working with the deceased in the Barnsley pit of the South Kirkby Colliery on the day of the accident. They were taking a run of eight full corves up a steep gradient to the "shunt" at about 7 o'clock. Samuel was at the front and Alfred behind, although Samuel said either of them could have been at the back, he was quite often the man behind and could easily have been on this occasion. The drawbar** of the first corve broke, and the other seven corves went back quickly. Samuel said he didn’t hear anything from Alfred but went back to check on him. He was lying at the side with his legs across the rails. The corves had gone by him, but he didn't know whether they went over him. Alfred was alive but unconscious and when Samuel got back with assistance he was dead. His right leg was crushed as were his head and shoulder. Samuel said he had worked with Alfred for 9 or 12 months and they had not had a drawbar break before, he added there were no orders as to where they should walk. Samuel had taken the drag** down with the empties, prior to taking charge of the full run, and told Alfred to put the drag on. Deceased knew where it was, they would not go without a drag on, they walked about five yards behind the corves, Samuel added even with the drag on the corves could still run back, however he had never known a set to over-run the drag before. He had not been down to the place since the accident and did not know whether the drag had been found or not. He knew they would be doing wrong if they did not use a drag. Alfred was fully competent to put the drag on and to know when the signal should be given. Frederick James Williams, colliery labourer, Kirkby Road, Hemsworth, said that about 7 o’clock on Friday evening he was in the Barnsley pit of the South Kirkby Colliery, when he saw the run-a-way corves coming down the incline. Alfred was running away from the corves, and as Frederick also had to run to get clear he lost sight of him. About two minutes after the accident he saw Alfred and went back to the corves, but the drag had gone. The road where Alfred was found was about 9 feet wide. Frederick had seen a few drawbars break, in his 30 years at the South Kirkby Colliery but could not give the date of the last time. Joseph Shelton, deputy of 56 Kirkby Road, Hemsworth, said the runaway was caused by the breaking of the drawbar of the first tub of the set and admitted it was part of his duties to see the corves were all right and in proper order but he could not say when he saw that particular tub before. He admitted it was possible for a corve not to be examined for many years and that there was no marking system to denote that a corve had been passed for work. Joseph said he saw the tubs,when they are standing or passing he would look at them, and if he notice any defects he put them on one side but if there were no tubs standing they were not seen. Joseph examined the fracture of the drawbar and expressed his opinion that half of it was holding at the time of the accident. He added that the fracture could not have been seen if it had been examined not unless the tub was turned up on end and closely examined. No record of broken drawbars were kept but it was very unusual for the drawbar to fracture. The Inspector was called to the place after the accident and found the deceased ready to be conveyed to the pit bottom. The rope-men were instructed to keep at least thirty yards behind the back of the train. Joseph said he had never had to tell Alfred that he was walking too close or to use the drag, he was a very careful workman. Joseph added that the train consisted of nine tubs and not eight as stated by a previous witness. He had looked for the drag, and had not been able to find it, he added that he thought a drag would have prevented the corves running away. There were also refuge holes down there and there was one near where Alfred’s body was found after the accident, he was between two refuges. There was room at the side to keep clear of the corves, but in his opinion Alfred was trying to reach the refuge hole. Joseph agreed with the Inspector that the refuge holes were very difficult to maintain in that part of the pit. Mr Snow informed the Coroner that ordinary vision would not have detected the fracture in the drawbar. If one had been suspected it would have been put under microscopic examination. He said that he had heard talk of a similar accidents in the pit, but not so many. He agreed that if the blacksmiths examined the drawbars it might help matters. There had been three rope-lads on that particular road until the day of the accident. During the week the number of men, whom the rope supplied, had been reduced by seven, and the rope-lads had not so much work to do as previously. Mr Burns suggested the possibility of having an additional coupler on the tubs so that, in case of a drawbar breaking, it would tend to greater safety but witness replied that he had tubs that have been doubly coupled but the links were not as strong as the hooks in use at South Kirkby Colliery. The Coroner in summing up said there was no suggestion of malpractice on the part of anyone. The occurrence seems to have been a pure accident. A verdict of "Accidental Death" was returned. ** Drag or Drawbar - A short length of girder hooked on to the back of dans or tubs when going up inclines, to prevent runaways. Drag (2) - Steel bar hung in coupling hole at the back of a tub to prevent it running away. I think two men jumped down the shaft at Manton just before I started, and I started work at Manton in January 1978, one man was polish, and the other was a lad called Moran I think or something sounding like that.